Although the current Sitka School Board and District are not responsible for the historic disruption of Tlingit culture and language in the community, they have an obligation to help restore it. That was the message of last week’s Impact Aid hearing before the Sitka School Board, in an annual meeting held at the ANB Founders Hall (4-3-19). The district receives $80,000 in federal Impact Aid, to support the cultural education of Alaska Natives. The school board is required to take testimony every year on where the Native community wants to apply those funds. 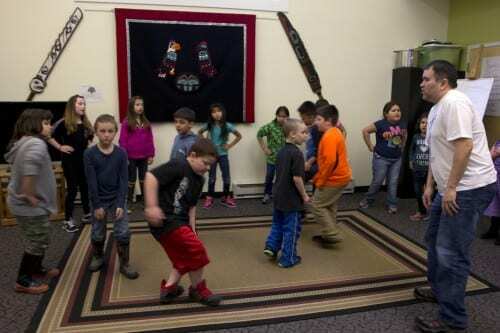 ANB member Spike Arnold argued for continued funding of Tlingit language classes in Blatchley Middle School and Sitka High — an expense which is shared with the Sitka Tribe. He called it a “two for the price of one” deal that was worth keeping, even in the face of ongoing budget pressure. Board member Dionne Brady-Howard seconded Arnold’s opinion, suggesting that preserving Tlingit language was of critical importance. She cited statistics from her own Tlingit teacher at the University of Alaska, Juneau. When he talks about language revitalization, his best estimate is that we’re somewhere between 20 – 50 fluent speakers of Tlingit, total. And maybe in the neighborhood of 100 Tlingit language learners. This is very much a language that is endangered. And while we are not the board, we are not the district who took that language from my people, we are the inheritors of the education system that did so, and as such have a responsibility to play whatever role we’re able to, to seek whatever grants we’re able to, to try to put some of that cultural education back, some of that linguistic education back, before we go the way of the Eyak and become an extinct language rather than an endangered one. Brady-Howard is a Social Studies teacher at Mt. Edgecumbe High School and an advocate for the Sitka Native Education Program — or SNEP. Brady-Howard’s grandmother, Isabella Brady, helped create the SNEP partnership with the district. She said that the value of the program was evident in alumni like herself, who formed strong cultural identities, yet were not isolated from the broader community. While cultural education in and of itself is not academic education — it’s not reading, writing, and it’s not math in a traditional sense. But I will say there are several of us who went through SNEP in its former incarnation. It gave us that positive sense of cultural identity that enabled us to go forth and do other things. And I would argue — I would argue to my grave — that it never has to be one or the other. It doesn’t have to be Western reading, writing, and math, or a culturally-educated Native person. I would like to think that I’ve successfully done that in my life. Asked by board president Jenn McNichol if the district could pursue additional funding opportunities, Nancy Douglas, the cultural education director for Sitka Schools, replied that the Sitka Tribe had recently submitted a grant application for a language education partnership with the district. She agreed to supply details to the board at a future meeting. The Impact Aid hearing concluded with no further action by the Sitka School Board.